Human Action is the most important book on political economy you will ever own. It was (and remains) the most comprehensive, systematic, forthright, and powerful defense of the economics of liberty ever written. This is the Scholar's Edition: accept no substitute. Case-bound hardback with beautiful cover designed for extreme use and durability. Best price of any hardbound edition. Preserved pagination of 1949 original. 1954 index prepared under Mises's supervision, united here with the book for the first time. Introduction by Hans-Hermann Hoppe, Jeffrey Herbener and Joseph Salerno--based on newly discovered archives--telling the tragic and glorious history of this seminal work and heralding its bright future as a manifesto of liberty. Keying to the world's first and only Study Guide to Human Action, by Robert Murphy, aiding in-depth study in a way never before possible. All told, The Scholar's Edition looks exactly like the classic work it is, ready for a lifetime (or two) of use. 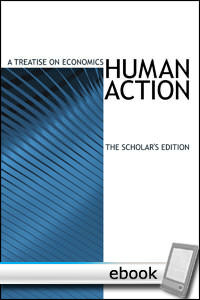 To provide such a comprehensive analysis is the task of my book Human Action , a Treatise on Economics. It is the consummation of lifelong studies and investigations, the precipitate of half a century of experience. I saw the forces operating which could not but annihilate the high civilization and prosperity of Europe. In writing my book, I was hoping to contribute to the endeavors of our most eminent contemporaries to prevent this country from following the path which leads to the abyss. The Scholar's Edition of Human Action is the definitive edition of this great work; the foundation of every library of freedom. This biographical tribute to Ludwig von MIses, 10 years in the making, is a broadly and deeply researched scholarly accomplishment. The impossible has happened: Human Action in a small pocketbook edition at an incredibly low price.